Gents, what do you do when the day is hectic and you know a shower isn’t possible? You either wing it or hope no one notices you’re not your freshest. For occasions like these and many others, Niche For Men has developed deodorizing wipes made especially for men. Individually packaged wipes, which are about the size of a hand towel (9×11), are infused with ginseng and aloe vera. What you’re left with is a very masculine scented wipe that’s good for one use but well equipped to get the job done. 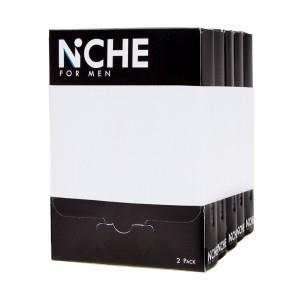 I recently tested Niche For Men after a night out at the cigar lounge and it easily washed away the odor of hanging out for a few hours in a smoked filled room. The best part, my wife couldn’t detect any cigar scent. My skin felt rejuvenated and moisturized. Tis the season for increased activities. After work cocktails, which can lead to flirty dinners and late night shenanigans is just one of many possibilities that can occur now that the weather is breaking. Do yourself a favor and keep these in your bag or at your desk. You won’t be sorry. Niche For Men sent a sample of this product to me but my opinion is my own. This entry was posted in Grooming, Product review and tagged Deodorizing Wipes, details, Men's grooming, Niche For Men. Bookmark the permalink. Is there a link we can find them on please? Portia, do let me know what you think when you get them. I think they’re great. These sound perfect to have on hand during the dog days of summer. Thanks for sharing. Definitely a good thing to have these on hand for when the temperature becomes oppressive during the summer months.